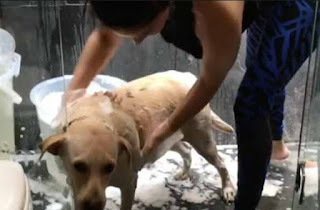 Watch the Video of Sunny Leone playing with her Dog and cleaning her God to stay Clean, In this video she just brings a new dog to home and she has given Bella name to that dog, and once she brought bella to home she cleaned her dog. sunnyleone: Bella desperately needed a bath! And I really wanted her to stay with me in my place clean. Now she's all clean! after the cleaning she started playing with her take a look.